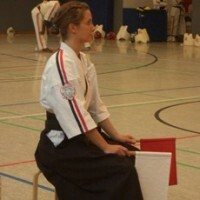 The Shindokai Dojo Hanover is the 1st dojo in Germany for Koshiki Karate. Koshiki Karate is not a style, but a scientific competition system. It emphasizes controlled contact by using Supersafe protective equipment consisting of a face guard (men) a body guard (do) and a groin protector (kin ate) as well as a corresponding training method which integrates practitioners of many different styles. Also training as a national or international referee can be part of the education. 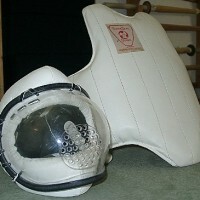 The development of this equipment enables the practitioner to fully develop kicking (Keri), punching (Tsuki) and striking (uchi, ate) techniques without injuring yourself or your partner. This means that all people, women, children and seniors alike can rapidly hone their Karatedo skills in a pragmatic and realistic manner. 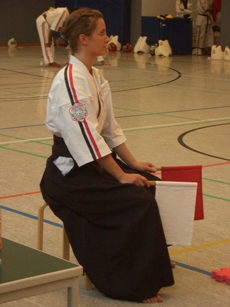 During the execution of even strong and powerful techniques, the risk of injury is amost ruled out. This leads to a stronger body and makes training and competition more dynamic. Also it heightens the excitement of competition for both the participant and spectator a like. Yet another benefit of being able to actually strike protected areas is the audible result of a kick or punch, making judging at competition easier and clearer. 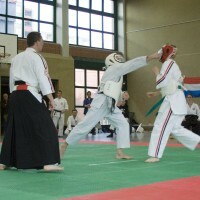 Together with the Koshiki Karate progressive set of competition rules, competitors can now display their Karatedo skills in the form of combination attacks and formerly prohibited techniques such as open hand strikes. As opposed to most non contact competitions it can also be scored with combinations and counter techniques. It therefore allows the Karateka to move more freely and act more creative in a fight. Koshiki Karatedo is not limited to any particular style or school of Karatedo and is been designed to permit practioners of all martial arts to test their skills under conditions of safety, sportsmanship, fairness and impartiality. Koshiki Karate was founded by Hanshi Masayuki Kukan Hisataka (10.Dan) and is organized in the World Koshiki Karatedo Federation (W.K.K.F.). The WKKF is spread world wide and enjoys great popularity with its practitioners. 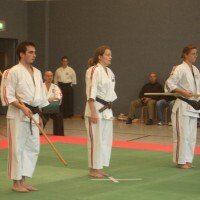 In Germany the Shorinjiryu Kenkokan Karatedo and Koshiki Karatedo e.V. (SKKD e.V.) 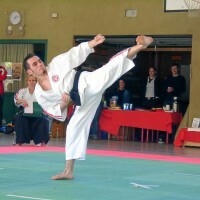 is representative of the Koshiki Karate. The So Hombu Dojo (headquarter) of Koshiki Karate is located in Tokyo/ Japan under the leadership of Hanshi Msamitsu Kudaka (8.Dan) and founder Hanshi Masayuki Kukan Hisataka (10.Dan). 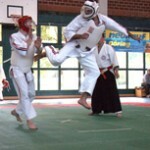 For further information go to www.shindo.de or contact Kyoshi Olaf Lotze-Leoni 7.Dan in the Shindo Dojo Hanover. Seminars and championships are hold regularly, please feel free to contact us.